Unsurprisingly, a ten-year-old child expressed more intelligence and concern than Trump did at the outburst, which remained unacknowledged. Trump’s own son, Barron, looks visibly shaken at the podium. He is able to emote that something is wrong, immoral and divisive. For Trump, however, these words have no consequence. 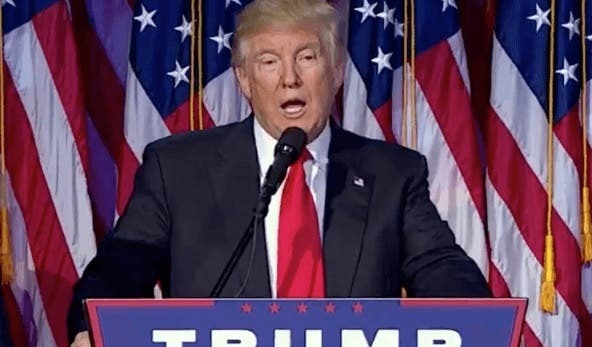 By remaining silent at the horrifying call-out during his acceptance speech, Trump has tacitly approved of the assassination of the current president. He has done nothing to discipline his supporter, only reinforcing the callousness and racism that his supporters have elected him for. In this climate, there can be no meeting halfway or middle ground. The country is in for numerous speeches that will no doubt mirror Trump’s first as president-elect. They will be narcissistic, meaningless and wrought with the hate and racism that Trump is able to speak to so strongly. Trump’s supporters are beyond control, and Trump makes no attempt at keeping them in-line. Judging by his rallies and now his first minutes being elected, wherever Trump goes will be a free-for-all. There is no interest in keeping up even the most basic social parameters, like don’t kill the president. Twitter has erupted with the hashtag “#KillObama” to symbolize Trump’s immediate first failure of not challenging or even reacting to, the cry for murder. Unfortunately, this is an especially volatile time to be a politician—Trump should not have been silent as a supporter instigates assassination in the middle of his acceptance speech. Who’s to say that when his supporters finally realize that Trump is totally unfit to lead, that the next cry won’t be for him.